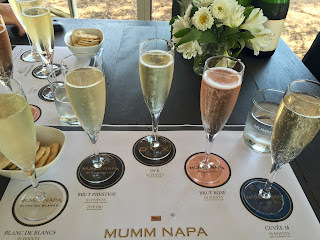 Mumm Napa was a must-do for my Napa Harvest 2015 trip. 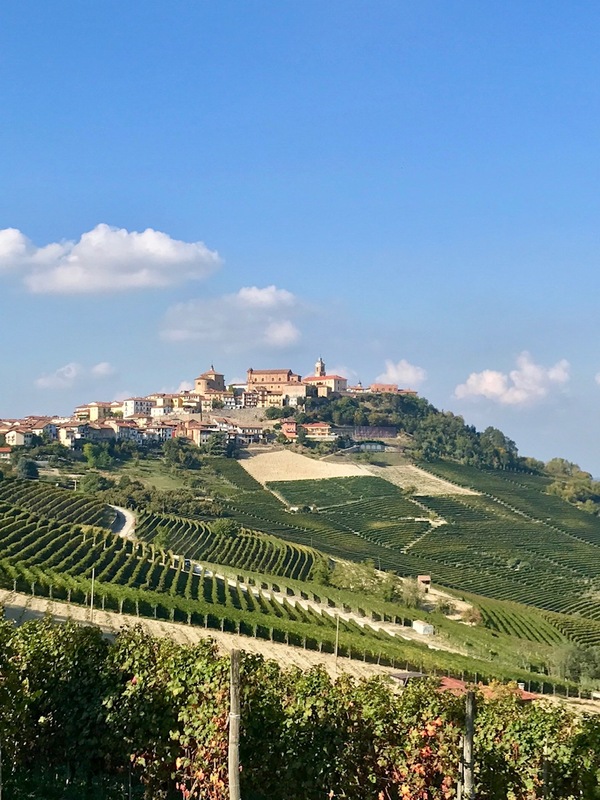 I have recommended their wines several times in various articles but I did not know much about their operation besides their affiliation with G.H. Mumm Champagne. The first thing that I learned was how little land they own. 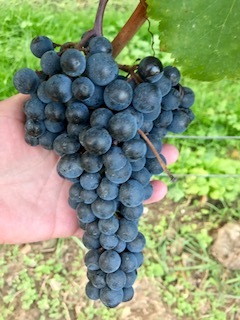 They, like most of the Champagne houses in France, source the majority of their grapes from local growers. 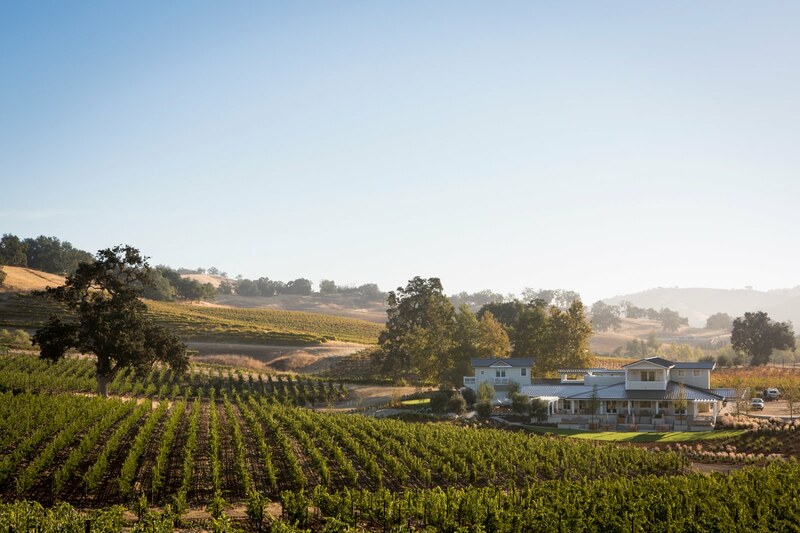 Practicing sustainability on their estate vineyard and purchasing from growers that have the same ideals has earned them Napa Green certification. 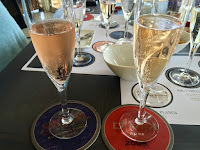 The next thing that I learned was how many different styles of sparkling wine they produce. 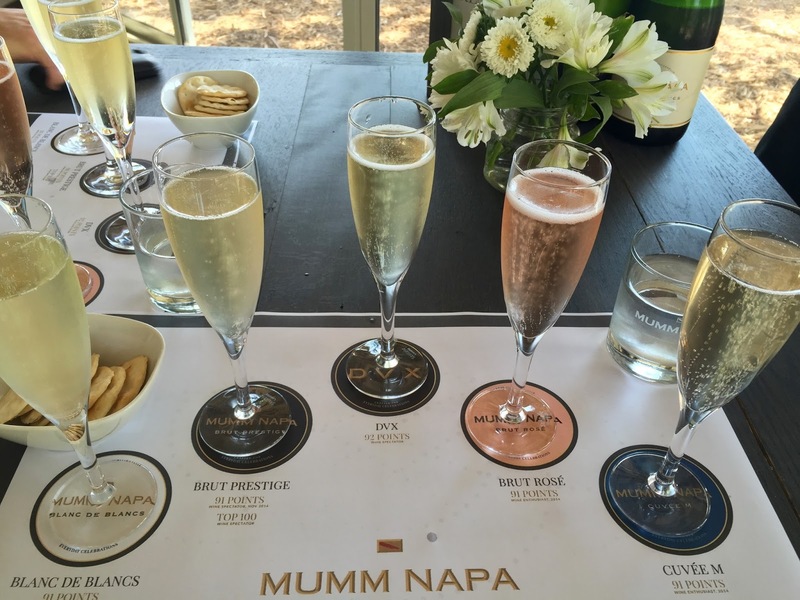 Mumm Napa is very available in the Houston market yet I don't think I realized how many style options were out there. 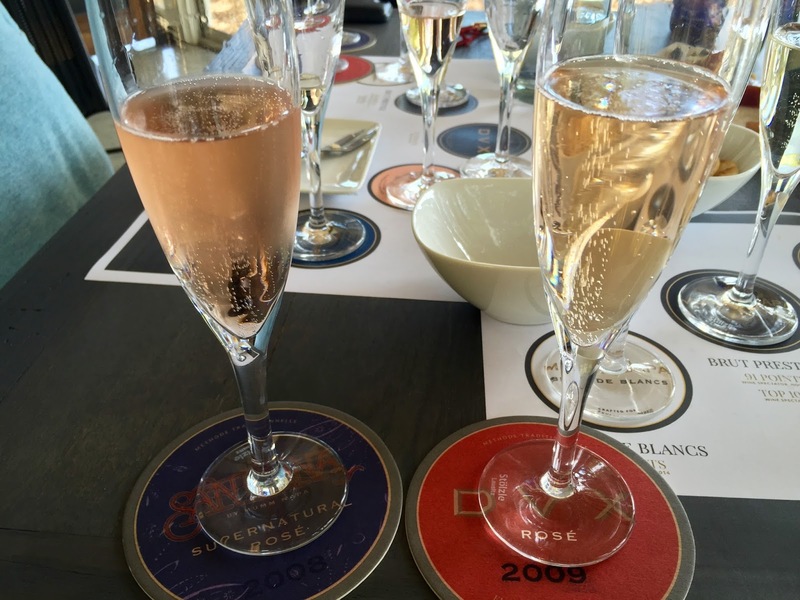 Miguel was on hand to educate us on all things Mumm Napa and bring us any wine from the list that caught our fancy. Aside from being very informed, he is very entertaining, he had us laughing before we had even tasted the first wine. Upon arrival, we found that he had us set up for a media tasting in the private salon. While individually, I would happily accept a glass of any of these, It is always interesting to taste them side by side and further clarify any personal preferences. Blanc de blancs (SRP $24)- 90% Chardonnay, 10% Pinot Gris; Fresh, clean, crisp, a little nutty; I already knew that I'm partial to this style. Brut Prestige Cuvée (SRP $22)- Blend- mostly Pinot Noir with Chardonnay; Highly rated and their best selling wine; fruitier with a bit of yeast, rounder. 2008 DVX (SRP $60)- 50% Chardonnay, 50% Pinot Noir; Creamier texture, more autolytic character, more mineral; love it. Brut Rosé (SRP $24)- 80% Pinot Noir, 20% Chardonnay; Always in my Thanksgiving line-up of wines, this is the one that I am most familiar, it is widely available in Houston, a food-friendly crowd-pleasing safe bet, consistent and affordable; softer, fruity cherry/berry/citrus. Cuvée M (SRP $22)- Too much residual sugar for me to just sip on but it has its place at the table with sweet and spicy cuisine; a baked berry/cobbler character. 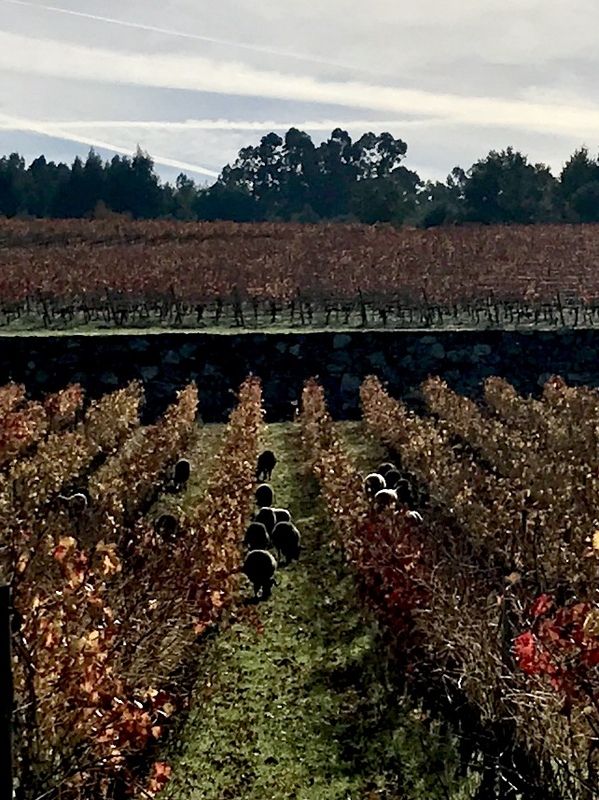 The final bit of new information that I learned during this visit involved the close association between the current winemaker, Ludovic Dervin, and musician, Carlos Santana. The two collaborated on a line named after the legendary guitar player to help support the Milagro Foundation which provides services for disadvantaged youths. I decided to taste the same vintage of the Santana rosé version against the winemaker's rosé DVX for the final tasting. Again, I wouldn't turn down a glass or bottle of either. 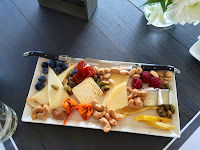 Miguel brought out a fantastic array of local cheese. It was absolutely delicious and made for the perfect afternoon snack. 2009 Santana Supernatural Brut Rosé (SRP $70)- A bit more residual sugar, fruity, round, smooth, creamy texture. 2009 DVX Rosé (SRP $70)- More lifted, fruitier than the 2008 DVX, less fruity than the Santana Rosé, a bit more elegant, more minerality. My preference out of these two wines. 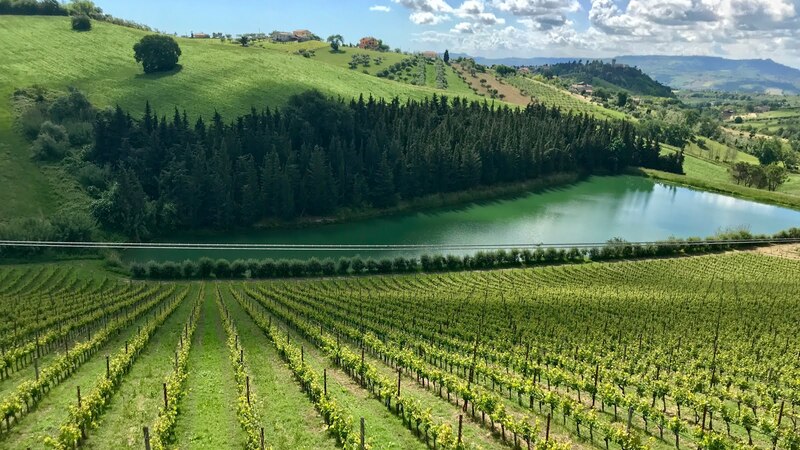 A fun place to visit and taste as well as a great place to refresh your palate between Cabernet tastings; a highly recommended winery to visit when in the Napa Valley. 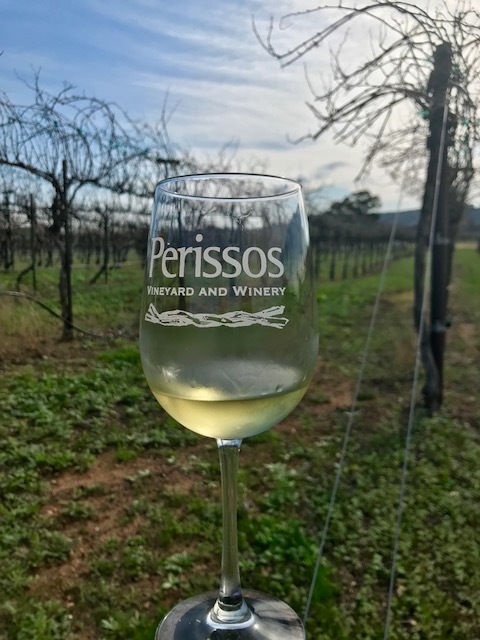 Open daily with tasting experiences ranging from $18-40, reservations required for some. 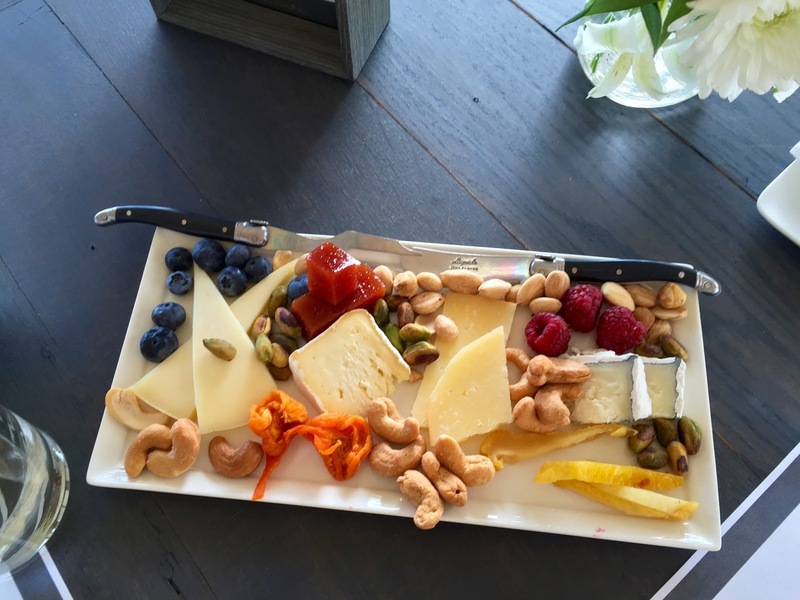 Artisan cheese plates have a supplemental charge of $25.